Efbet has been on the market for a while but under a different name. BalkanBet was launched back in 2003 and started out as a sportsbook. 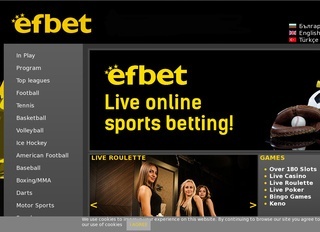 In 2011, the company changed the name of the bookie to Efbet. Nowadays, the online bookmaker offers not only sports bets but casino games as well. The group behind the name Efbet is Eurofootball Limited – a company registered in Malta. The bookie is regulated by the State Commission of Gambling of Bulgaria under several licenses. Efbet offers all popular sports and the most sought-after casino games. This, coupled with the professionalism and experience of the team, made Efbet big quite fast. Of course, the bookie still can’t compete with the largest players on the market, but that’s not its target. For now, Efbet steadily gains customers. A massive advertising campaign in Bulgaria brought lots of visits to the website. The traffic numbers have been going down since May 2016, but not by much. Efbet is clearly capable of holding the majority of the players. The online bookmaker is ranked 240 in the list of top Bulgarian websites, with some visits from Italy, Bosnia and Herzegovina, Portugal, Turkey and other countries. Efbet’s website design is very professionally made. When you visit, you are welcomed by a beautiful landing page. The main menu is primarily dark-grey, with green accents. The list of sports is on the left side; the middle is taken by In-Play games, and the right column contains mini games, the bet slip and some more information. 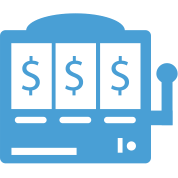 Overall, the usability is better than most online bookmakers and if you have ever used a betting website – you will know what to do on your first visit. Efbet offers a lot of variety to the players. The bookie supports over 20 types of different sports. You can enjoy your favorites, with Football, Tennis, and Basketball among them. Efbet also provides markets in politics and movies. Players can make some money with the upcoming US Presidential Election or the Game of Thrones specials. Another great addition to the bookie is the Esport section. Fans of games like CS:GO, Dota 2, League of Legends and StarCraft 2 can enjoy betting on their favorite players and teams. One very lucrative side of regular sportsbooks is the Multi-Bet option. You can pick from several premade lists and bet on a number of games at once. The more you succeed, the more you win. The casino section of Efbet is well-developed. You can enjoy classic games like Roulette, Bingo, Keno, Slots, Video Poker and others like Blackjack and Baccarat. Jackpot games are always active, and you can rack up some nice winnings by making use of the promotions. Efbet also provides real life casinos. If you are near one, you can visit and experience their games in person. Some of the most popular slot machines are currently 20 Super Hot, Burning Hot, Rise of Ra and Age of Troy. Certain machines are eligible for the Gamopolis Jackpot. Players can earn varying sums of money every day – for example, 83 EUR for silver and 895 EUR for gold. These numbers change regularly, so don’t miss your chance for great winnings! Efbet offers some great odds. The markets categories are neatly sorted in tabs for easier navigation. No more continuous scrolling to get to your favorite bet types! For football matches, you will usually find more than 100 markets per game. The regular Match Result, Under/Over, Total goals and Asian Handicap are always present. However, you can go deeper with your bets on markets like 2nd Half Result, Win to Nil, Result after the first 10 minutes, To Win from Behind and much more. The odds on Efbet are average – they are not high, nor low. The rates are stable, and the payout rates are almost 100%. Of course, you may find higher odds somewhere else, but your payout won’t be guaranteed. Efbet’s website uses the latest in cyber security technology. The secure TLS connection is protected by a COMODO ECC issued system. Your data and transactions are completely safe on the Internet. Efbet is also regulated by authorities in the betting industry, so players should expect a fair environment. The service is available in the Bulgarian and Turkish languages. Efbet’s customer support is fantastic in any way. They always seem ready to help with a smile and professional demeanor. You can reach the support department by telephone, e-mail or live chat. There are no working hours specified on the website. Managing your funds is very comfortable with Efbet. There are several ways you can deposit and withdraw money from your account. Some of them are Visa, Mastercard, bank transfer and the popular e-wallet services. Consult the table for more information on that. As for deposit and withdrawal fees – the services are completely free! The only limit is the minimum amount you can operate with – 10 EUR. Players cannot deposit or withdraw lower sums. Efbet has a very nice welcome bonus for new clients! 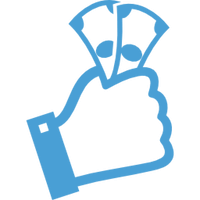 As the first licensed Bulgarian online bookmaker, the company gifts 100 % on your first 100 EUR deposit as a welcome bonus. The bets must be placed on odds equal or higher than 1.50 and it is required a 3 time turnover on a total amount (sport events only). Efbet gives out numerous reload bonuses, too. The interesting thing here is that they are only offered to loyal clients on a monthly, weekly and daily basis. You can receive your private offer by e-mail or SMS, so you are encouraged to provide your real data. The bookie will make sure you won’t regret this decision. The Matchplay Casino Bonus is effectively the same offer as the reload promotion – just for the Casino.